• Exact Buffer Technology provides dynamic scale removal, keeping pH stable for constant hard water mineral elimination. to remove tough lime scale and soap scum. 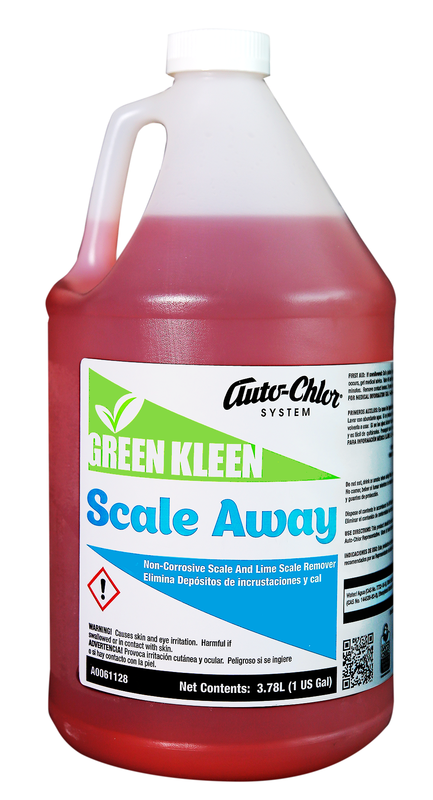 • Scale Away is now safer for the environment and is an EPA Safer Choice certified product. • Non-abrasive acidic composition removes scale buildup without damaging surfaces. • Scale Away is soft metal safe and can be used to remove scale and tarnish from metals such as aluminum, copper and pewter. • Advanced blend of chelating acids and soil lifting surface actives provide unsurpassed scale removal performance on all hard surfaces. Scale Away Lime Scale Cleaner employs Exact Buffer Technology to give safe and effective descaling activity on all hard surfaces, including soft metals, such as aluminum, copper and pewter. Exact Buffer Technology reduces risk of acid burns, while producing effective pH for any descaling task.It is also safe for the environment and is registered with the EPA Safer Choice as an environmentally friendly product. Its optimized blend of chelating acids and surface active agents produce extremely effective cleaning of the toughest hard water stains, soap scum and lime scale. The heavy duty formulation is safe to use on all washable surfaces and perfect for scale removal on any hard surfaces. When safely used, Scale Away is an excellent general purpose cleanser for all metals, glass, ceramic, tile and concrete. Dilute for descaling coffee urns, steam tables, kettles and more.